We are delighted that ‘Talking Mats in German’ is now available in the Digital version and includes the latest technical and symbol upgrades. These upgrades are also now included in the English version. Please click on this link to find out about all the upgrades. 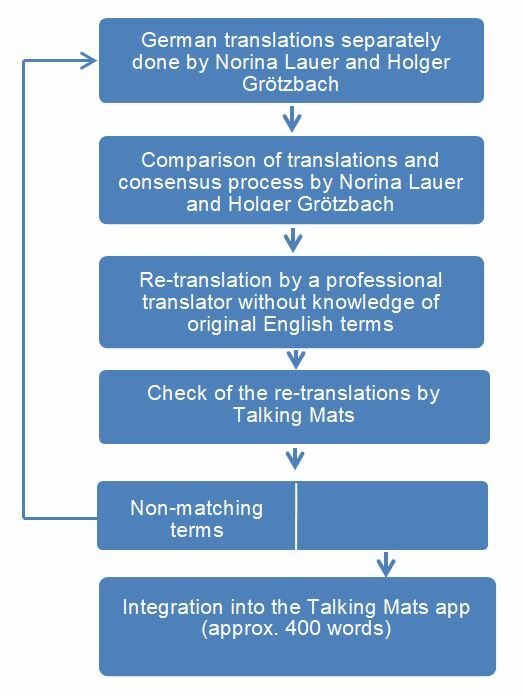 We are very grateful to Prof Norina Lauer for sending us this blog which explains how ‘Talking Mats in German’ has been developed. In 2016 Prof. Dr. Norina Lauer, a German professor for speech language therapy contacted Joan Murphy from Talking Mats because she was initially interested in the digital version for goal setting with people with aphasia. We found out that it would be interesting to have a German version of the app. So we started a project for translating Talking Mats into German. Prof. Dr. Norina Lauer managed the translation process. The project was financially supported by a German health insurance “BKK Dachverband” in cooperation with the German aphasia self-help organization “Bundesverband für die Rehabilitation der Aphasiker” (www.aphasiker.de). The translations were performed in a special scientific procedure to make sure that they match the English terms. Norina Lauer and her colleague Holger Grötzbach independently translated the English terms into German. Subsequently these translations were compared and the differing terms were discussed until a consensus was reached. The agreed translations were given to a professional translator who only got the German words and the corresponding pictures. She re-translated the terms into English and these re-translations were checked by Talking Mats if they were in accordance with the original English terms. 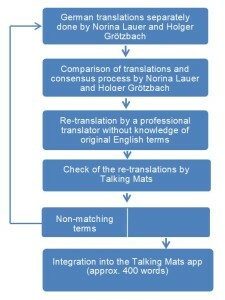 For those terms that did not match, the process started again until all terms matched the original English terms (figure 1 shows the translation process). This process was performed for all topics of the app. 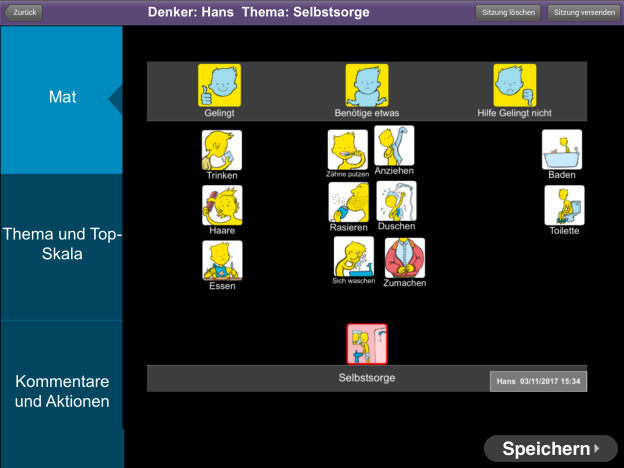 So we have the complete Talking Mats app in German now. Norina Lauer completed the foundation training and the accredited training in 2017. In October 2017 she performed her first foundation training for 6 of her SLT students. One of these students will do her bachelor thesis about the German app version in 2018. Under accompanying consultation of Norina Lauer the student will perform two workshops for people with aphasia. In these workshops they will practice doing Talking Mats and afterwards evaluate the app concerning its content and practical use. For the evaluation we are planning a short questionnaire and a focus group. It has been a delight to work with Norina and we look forward to hearing the results of her student’s project. If you already have the Digital Talking Mats make sure you upgrade to get all the new features. The German version with the upgraded is now available from the App store, Google Play (Free and Lite versions) or purchase the full version from our website . This entry was posted in Aphasia, Digital Talking Mats and tagged digital, Research, Talking Mats on December 15, 2017 by Joan Murphy. 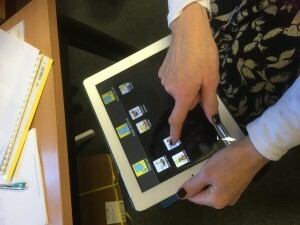 Communication Access UK –Have your say? Get involved in choosing a Communication Access UK Symbol , and set the standards to go with it! People with communication difficulties don’t always get the support they need in the community. Communication Matters now want to hear from more people, with and without communication difficulties. This entry was posted in AAC, Blog, Communication difficulties, Participation and tagged AAC, Communication difficulties, empowerment, Participation on December 8, 2017 by Rhona Matthews. Do you need training to use Talking Mats? Talking Mats is an effective but deceptively simple tool so a question we are often asked is do you need training to use it. Communication and supporting people with communication difficulties is a complex process and Talking Mats is based on a number of research projects which examined who could use Talking Mats, and how best to use it in different situations. It is therefore important that the integrity of the Talking Mats model is maintained and that Talking Mats training teaches the principles developed from our evidence base. 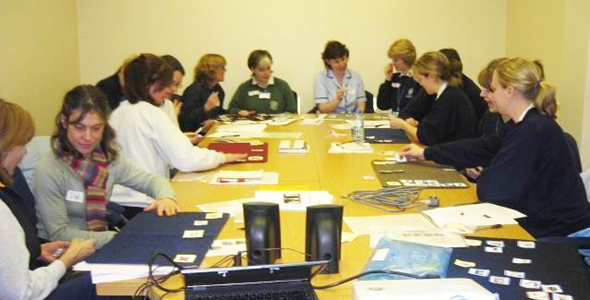 All our trainers are registered with Talking Mats and provide high quality training based on robust research findings. Only trainers accredited by Talking Mats are eligible to train others. ensuring there is a summary at the end so that both parties agree on what was said . This is why we put so much emphasis on training. We have developed our successful “Train the trainer” scheme to ensure that quality is maintained and reflective practice maintained. If Talking Mats is passed by word of mouth then key aspects of the framework are missed and/or misinterpreted which in turn lessens its effectiveness and impact. People who come on training are often excited, want to tell colleagues and share it with others. Demonstration and sharing is fine, but it is important to be aware of the difference between sharing and training. Sharing can often be appropriate especially when there is a team of people supporting the person or parents are keen to see how it works. You can show someone how to use a Talking Mat about a specific conversation. We call this a ‘demonstrating model’. It is helpful to give the listener the words to say to go with it. That way you are enabling other colleagues or family members to have an effective but specific conversation only. So do you need training to use Talking Mats ? The answer is a resounding yes . Training supports you to be an effective Talking Mats listener and get the most out of this versatile communication framework. So if you have not attended a course check out our course opportunities There are lots of way you can access this training e.g. through the train the trainer network, through core training run frequently in the UK and Australia or through our online course. This entry was posted in Blog, Communication difficulties, Talking Mats principles, Training and tagged Communication difficulties, Talking Mats, Training on December 1, 2017 by Rhona Matthews.